Well winter must be coming, because Alive Events and Hi FM have announced another big concert coming this February Friday 27th February from 7pm. Hopefully we'll see more gigs announced soon as the winter season sets in! Speaking of winter, it's still really hot outside... I wonder when it'll get down below 20?! The nice people at Hi FM gave me 2 fan pit tickets to give away for this concert, so if you'd like to win 2 fan pit tickets to this event, all you have to do is leave a comment here with your contact number or email address, if you want to double your chances, get over to my fb page and comment there too - only one entry on here and one on the fb page, any multiples will be ignored. Winners will be announced in a week or two! Mackenzies Cafe & Deli, Bose store in QCC, Donner Kebab outlets in both MCC and Zakher Mall, Gorgeous hair salon, Connexions store in MCC or the OUA retail outlet in MQ. You can see the official (even after all the leaks yesterday on fb) announcement on the Hi FM website here. Also there is the official fb event page available here. Ed Sheeran! I wanna win! Hi would love to treat my daughter to this concert. She turns 16 and will ne the perfect gift! Look forward to it. Love to go and see him - what will he be shearing live ? Yes please, give me the ticket! The last time I left my email here for a competition I opened a whole can of whoopspam! I'd live to win (for my wife). If I'm eligible with my email in the Google account. Ed sheerannnnn.. wow.. would luv to be a part of the lucky pit.. 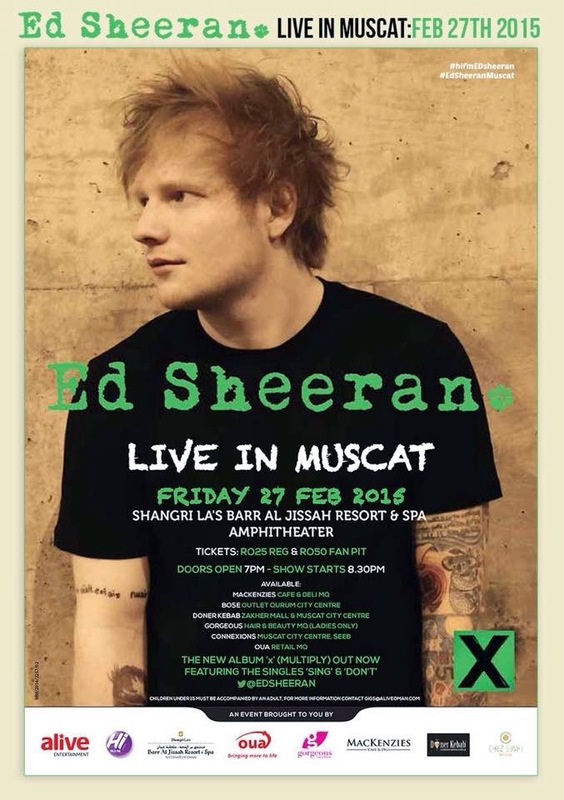 I would love to win and see Ed Sheeran singing live here in Muscat! Sooo excited! OMG! So glad to see this! Thank u Hi FM, absolute legends!! Cheers! Hope I get picked ..I've been waiting for someone to come to Oman . Still can't believe ed is coming! Sitting in my LEGO HOUSE tonight, THINKING OUT LOUD... I want those tickets! YOU NEED ME, I DON'T NEED YOU is probably what you are thinking - that is true, you DON'T need me... But if you give me these tickets, I promise to get DRUNK and SING my heart out in the fan pit... In fact, I will be screaming so loud, people will think that I SEE FIRE. Although there is ONE potential SMALL BUMP in the road, I am not that photogenic - thankfully my partner is GRADE 8 at the very least (how she can bare to KISS ME is anyone's guess). Anyhow, regardless of whether I win the tickets or not - you are THE MAN. Keep us the good work on this blog, really beneficial for all living in THE CITY of Muscat. I'd really like to win the ticket!